After the rather easy battle of last time, you might be thinking that the Black Forest ain’t such a bad place for a stroll. Chopping saplings and gathering their loot doesn’t seem to be that hard. Think again. Uh, oh. This is a completely different kettle of fish from the last battle. For a start, I’m surrounded on all sides by trees and there’s no way for my warrior and priest to protect Elva, my wizard. Secondly, the trees are almost within striking range. Thirdly, two of those trees are the weedy Beech Saplings I faced last time, but two are the much tougher Maple Trees. And finally, I got a pretty bad draw with Sir Otto drawing a Trip card that will keep him immobile for the whole round and Elva ending up with a hand full of movement but little else of any use. I’m going to spare you the details of this battle, because it was pretty ugly. Let’s just say the trees closed in an finished off Otto and Thorgon pretty quickly. Elva danced out of the way and played hide and seek with the trees and their inanimate companions for a few rounds before she got pinned in a corner and taken down. Did you know that Beech Trees have Long Thin Branch in their decks? It’s a 3/4 (damage/range) Melee Attack. With a range like that, it’s hard for a Wizard to stay safe. When you lose a battle, you can immediately “regroup” and attempt it again. You’ll usually want to do that because you don’t get experience points until you complete the whole adventure. If you bail on the adventure because you want to re-outfit your team, you’ll have to start from the first battle all over again. I’m only two battles in, so it’s not a big deal, but I think I can beat this battle with a better draw. I do get a better draw and, this time around, I hack those trees to pieces and move on to the third battle. According to the sages, the King of the Oaks lives in the middle of a clearing deep in the woods. You spy such a clearing up to the north off the track, but here there only elm trees… and the violent War Monkeys who make their home there! Wait, who said anything about War Monkeys? I’m guessing from their name that they aren’t the friendly type who dance around to organ music. The five monkeys are split into two groups. I know nothing about their decks at this stage other than that their default move card is Run. I’m guessing that they are melee-focussed monsters though. Being monkeys, they’ll probably have some sneaky tricks to pull, although I’m not expecting a lot of armor, so my armor shredding stuff will probably be a bit wasted. This is the kind of stuff that can make adventures a bit tricky – when some cruel designer throws in something unexpected that forces you to adapt and not just build a set of decks that are too highly focussed. It’s also where your mule can be of use because if you lose the battle you can re-equip anything that you packed onto your mule to change your decks around a bit. In this case, I didn’t bring anything else with me since I wanted to keep Ben free to load up with loot. That could come back to bite me if these monkeys prove to be a problem. Anyway, I’m opening with a pretty decent hand. Otto has a couple of Attacks and some Armor, Thorgon has a Block, a Bash and Inspiring Armor and Elva has a couple of ranged Magic Attacks. Inspiring Armor is an interesting card – it doesn’t prevent a lot of damage, but each time you get hit every ally draws a card! I think that card dictates my strategy here. I’ll move Thorgon up in front and hope that the monkeys blow their attacks on him. The Block should absorb at least one and if I get hit again that will inspire Otto and Elva who can then unload their attacks on my simian foes. I amble Thorgon forward with his Walk card. It’s the monkeys’ turn. They play Scamper! That’s bad news, because Scamper is a Free Move card meaning that the monkeys don’t have to stop when they move adjacent. That’s going to make it hard for Thorgon to stop them moving past. Luckily they only just get into range this turn but if they have more Scampers in hand, I could be in trouble. I move Otto forward to try to stop the monkeys reaching Elva. Looks like the monkeys might be out of Scampers. A monkey punches Otto with a 5/1 Melee Attack. His Solid Mail triggers and prevents 3, netting 2 damage. I can live with that. Otto has his Mail, which has already proved its use. He also has Violent Swing, a 10/1 Attack and Hack, a pretty mediocre 4/1 Attack. The War Monkeys have 12 health, so if I play both those Attacks and neither is blocked or stopped by armor, I can kill one monkey. However, Violent Swing requires that you discard your oldest card when you play it. If I play Violent Swing first, I’ll be forced to discard Hack (your oldest card is on the right of your hand). If I play Hack first, I’ll have to discard my Solid Mail when I come to play Violent Swing and I’d really rather hang onto Solid Mail if I can. Hmm…. There’s another reason to play Hack first though, which is that if the monkeys are holding any blocks, I’d rather trigger them with a weak attack than a strong one. If I Play Violent Swing first and it’s blocked, I’ll have effective wasted two cards for one. That settles it – I’ll plan on losing my armor and just Hack away. It turns out that the monkeys have no blocks in hand nor any armor, so I score 4 damage. In their turn, the move in closer, getting one monkey right up next to Elva. Luckily it’s the one I already hit for 4 points, so I use Violent Swing to bring it down. 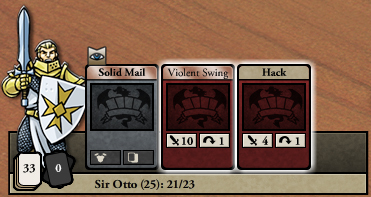 I lose Solid Mail, but that’s an OK trade-off for taking out an enemy. In turn, another Monkey stabs Thorgon – just what I wanted. Inspiring Armor triggers, giving Otto and Elva cards. Unfortunately, it doesn’t stop the damage because the monkey’s Sharpened Bone Stab is Penetrating and bypasses the armor’s damage prevention. Also unfortunately, I have to discard the armor, because Inspiring Armor doesn’t return to hand after it is triggered. Oh well, I’m still up one card from the deal. That ends the round. I won’t bother narrating the rest of this battle – it’s bloody but relatively brief. Sir Otto is knocked out by a rather nasty card the monkeys are packing called Brachiation (look it up) which allows them to move and do damage at the same time but Thorgon and Elva are able to rally and defeat the rest of the troop. Things are definitely made a bit harder by the dead Boiling Armor cards I’m drawing from Elva’s deck – not much use when your opponents don’t have any armor. But the monkeys are weak enough (or my draws are lucky enough) for me to get through the battle and head deeper into the forest. I hope you are enjoying the glimpse into some actual Card Hunter play. My plan is to produce some gameplay videos with narration in the near future once we have the game polished up a bit more. 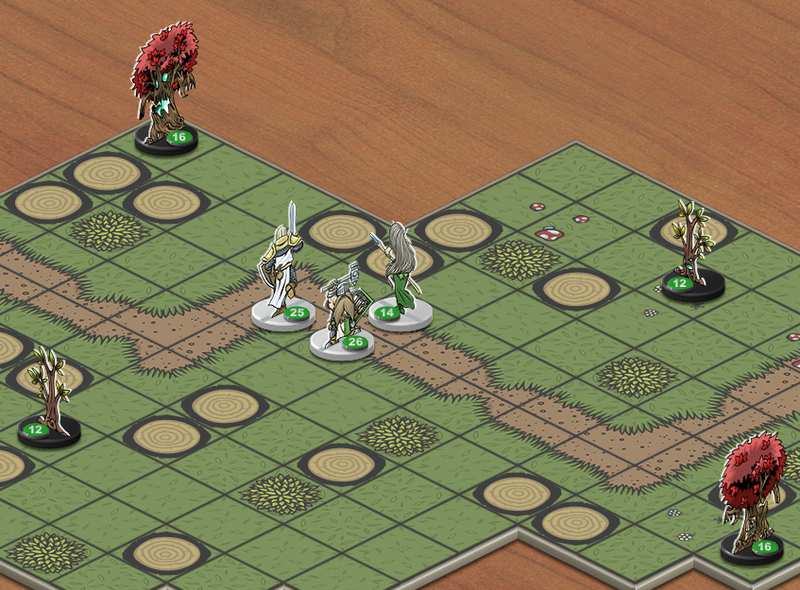 That will allow us to delve much more deeply into the strategy and intricacies of the card play and movement. Next week I’ll skip forward and talk about the final battle in the adventure and some of the lessons I gathered from this playtest. So experience is for completing the entire adventure, it doesn’t matter to Otto that he got knocked out in Round 3? Getting knocked out won’t affect experience gathering, no. Aha, Brachiation in a tree deck—very on-theme! Looks great, love the way the models look in comparison to the board. It really looks like something i could play at home. what is maximum size for a game board? Will we be able to create huge sprawling dungeons? There is no maximum board size, however, we don’t tend to make them bigger than around 15×15 otherwise it gets boring just moving from one side to the other. oh I just read that the map editor might not be available to players. I still would like to know how large are some of the biggest dungeons in the game? Will we ever have any “epic” sized dungeons that are on the same scale as “World’s Largest Dungeon” by Alderac Entertainment Group for DnD? Here’s a question. If a character is knocked out or is badly injured. Will they be back up to full HP for the next encounter? Or will they be at 1 HP or the number they were at previously? Yep, they always start each battle at full health. when I can play it?? ?